Last week, I challenged you to visualize education and practice thoughtful use of color and words to create a visual story. 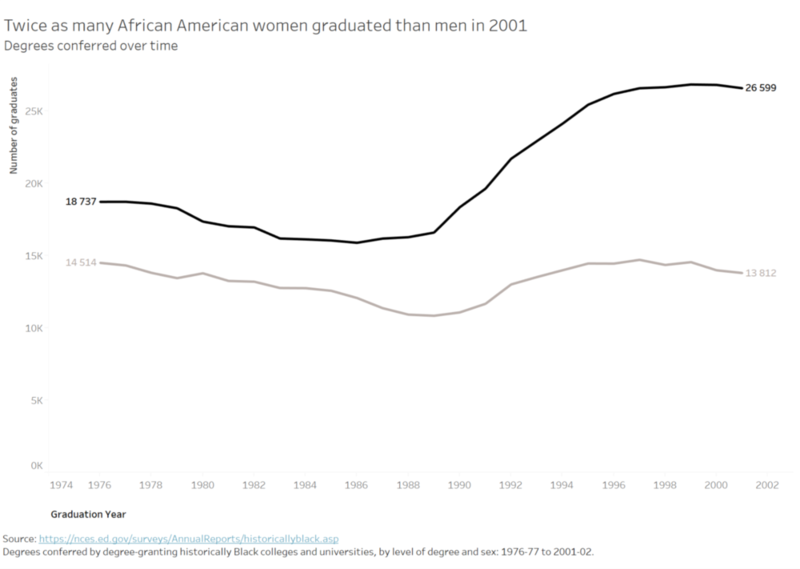 This is part of a month-long celebration of Black History to #VisualizeDiversity in collaboration with data.world, Tableau Public, #MakeoverMonday, Viz for Social Good, and Data for Democracy. This is the recap post where I'll share back with you all of the great work that was shared with me as part of the February 2018 installment of the #SWDchallenge. A number of people focused on the gap, often filling it in as a means to quickly draw attention, which worked well (see submissions from Zak, Tamara, Neil, Jeff P, and also Lindsay's, which draws attention to the gap via vertical lines in a way that looks quite slick). While there were some positive stories highlighted—degree growth for women (Sateesh), decreasing high school drop out rate for males (Lindsay), division I African American students closing the graduation gap (Jeff P), unemployment falling as education increases (Divya)—a common theme across many of the visualizations was the need for more progress. I thought Sarah's empty outline of opportunity in her bar graph depicting teachers from diverse backgrounds worked quite well. A number of people used maps, some quite creatively to encode data in different ways (see Sara's tile grid map depicting states still under federal court order to desegregate, Rob's 32,000 areas of educational attainment in the UK, and Alistair's small multiples of the graduation gap by state). On the opportunity side, I would have liked to see more takeaway titles. There were definitely cases where this was done well (to name a few: Sharon, Sean, Emily, Elizabeth, and Brittne), but I think there is opportunity for more of this. As a related note, I had a short Twitter chat where the question was posed of whether titling interactive visuals with a question would make people more likely to dig into the data. I'm not sure that's the case, but I'd be curious in others' views here. I do think there is room for a takeaway title even when you do allow people to explore the data, as you've likely looked at it more than they will and so are in a unique position to be able to teach your audience something new, or help them get started when it comes to what to look for in the data. In all, I am impressed by the breadth of topics, varied approaches (lines, bars, scatterplots, small multiples, slopegraphs, dot plots, unit graphs, waffles, and more), and tools that people used (Tableau, Excel, PowerBI, Python, d3.js, Illustrator) to visualize education-related data and teach us all something new. A couple notes to those who submitted examples: first off, THANK YOU for taking the time to create and share your work. In my copying/pasting, if I've misrepresented anything or failed to include a social media profile you'd like to have linked, please send a note with specifics to swdchallenge@storytellingwithdata.com and I'll take care of it. The makeovers are posted below in reverse alphabetical order (the A's can't always go first, right? Sorry Adam!). If you thought you submitted a graph but don't see it here, please send a note with your visual to the address above and I'll add it (I think I got them all, but you never know). If you like to plan ahead, the next #SWDchallenge will be announced on March 1st. In the meantime, be sure to check out week #3 of the month-long #VisualizeDiversity collaboration celebrating Black History Month with data.world and Tableau Public, with Chloe Tseng's viz for social good—with project specific info available on the site and Slack channel. Without further ado, below you'll find all of your awesome entries in the February installment of the #SWDchallenge. This visualization shows the education gap between black and white students and how certain challenges may have contributed. You can find more of my work on Tableau Public and by following me on Twitter. 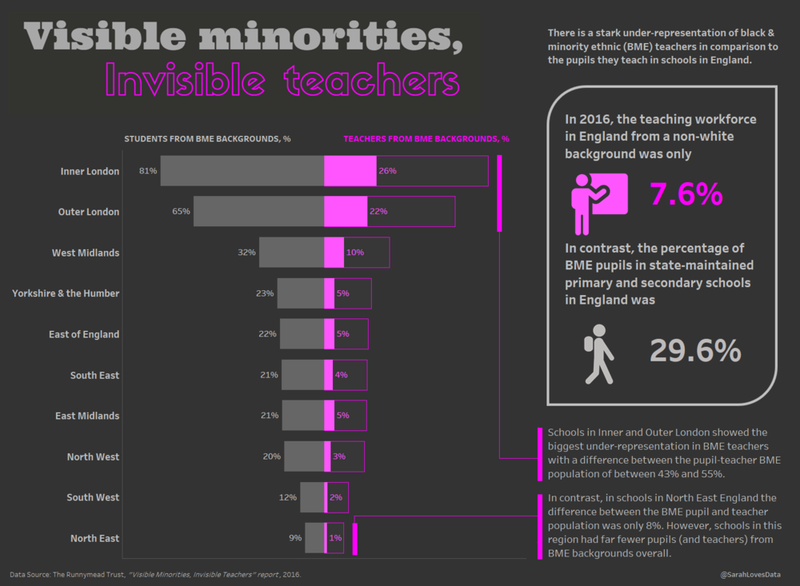 For this challenge I decided to look at the under-representation of teachers from black and minority ethnic (BME) backgrounds in schools in England. While England is a relatively ethnic-diverse country, the vast majority of teachers still come from white backgrounds. As a result, students from BME backgrounds are more likely (than white students) to struggle to find role models they can relate to in their school teachers. Taken at face value it is easy to assume that teachers from BME-backgrounds are less drawn to careers in teaching. However, this is not necessarily the case. According to the findings of a recent study there is evidence of everyday racism in schools and colleges including discrimination, harassment, ostracism, lack of pay progression, and BME teachers being held back from promotion. 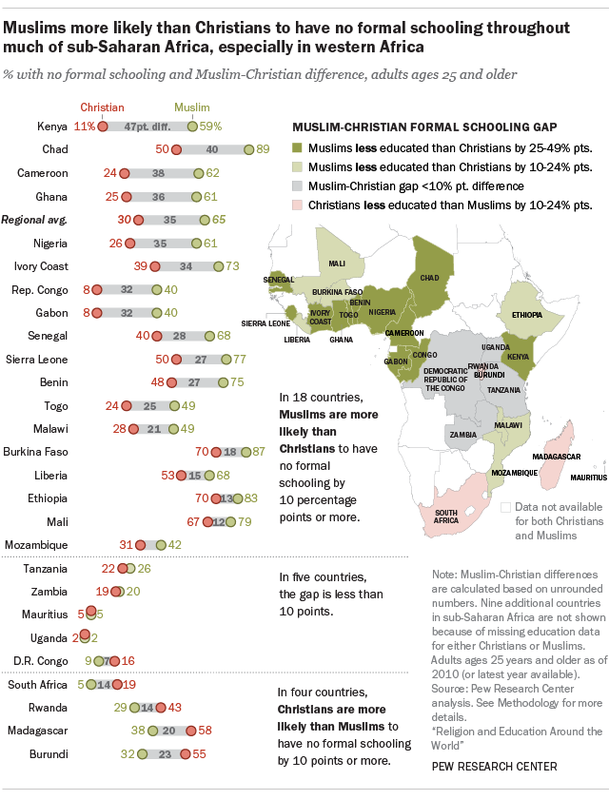 Taking these factors taken into account may go some way in explaining why the under-representation still exists. You can interact with my full visualisation on Tableau Public. This didn’t turn out as well as I hoped. The map maybe a bit over the top for this challenge, but maps seemed to be a little ignored in your work, and getting 32,000 areas on a map in semi-coherent way is a challenge. 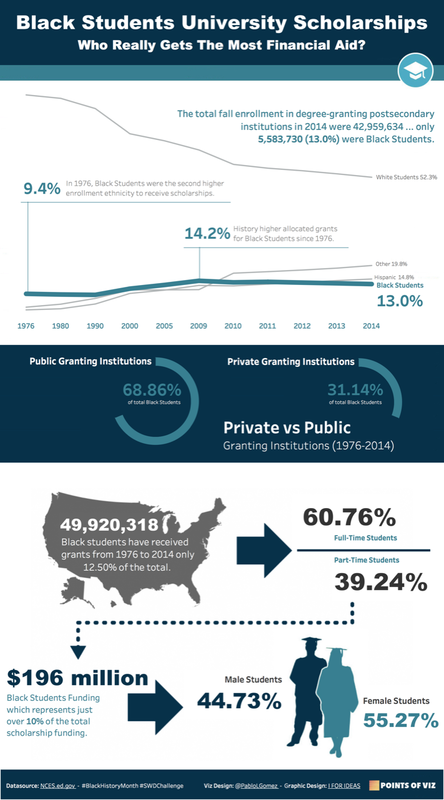 The Graduation Race Gap in American public schools. Interactive Viz. Design by @VizDrath. Here is my #SWDchallenge dashboard on Ida B. Wells. I wanted to find someone I didn't know about and share some of the high points that I learned about them. She was a pretty remarkable person. Hopefully it works for what you asked for in the instructions even though it's not directly measuring anything in education, but rather providing some educational material for others that may not know about her. I looked at the ethnic divide in educational attainment at the school level in England. I compared the performance at GCSE level in English and Maths of students from ethnic minority backgrounds to White British pupils who made up 93% of pupils who took these exams in 2017. More details here. I used Python and matplotlib to create this visualization. A more thorough write up can be found on my ipython notebook. Growing up in New Zealand I wasn’t given an education in Black history. For me, this month’s data storytelling topic was an amazing (very small) insight into American history. My biggest challenge was attempting to understand an audience (diversely opinionated and with a possible strong inherent bias) and present data in a hopefully non offensive way—without losing the story. This was built using Adobe Illustrator (link). We analyzed weekly connection patterns of new students and found 6 clusters, four of them (in light blue) representing a different pace (6-7 days per week, 5 days per week, etc. ), and the other two showing disengagement (in red), one from the very beginning (like "I don't know what I'm doing here") and the other after a few weeks ("I tried, I failed, I quit"). The dropout rate for these two groups is clearly different, providing us with some hints about when and how to detect students at risk. For the topic of education we decided to look at education rates in Africa: specifically, how many children are enrolled in primary schools in each country. As “colour” was one of the key aspects of the challenge this month, we opted for a choropleth heatmap: not only is this an inherently colour-based approach, we felt that a map would best show how low scores tend to have geographical grouping. (We tend to find calling this graphic a “choropleth heatmap” gives laypeople more of an idea of what we’re doing). Having used the data set of all children for the main map, we wanted to drill down and see what the gender differences were like. Here we focussed on the biggest differences in enrollment rates between boys and girls – but retained the colours from the first graphic in the country name labelling, to give an at-a-glance idea of whether there was a correlation between big gender gaps and low enrollment rates (and there is some crossover between poor performers in each area). 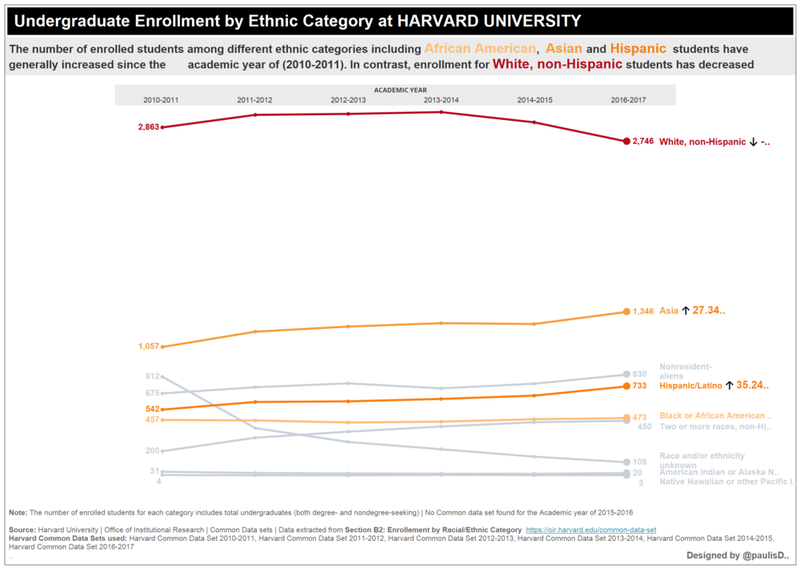 The second chart highlights the gender difference – but also allows viewers to tell if a big gender gap sits in the context of overall high enrollment. We deliberately opted for white for this section, rather than ‘usual’ boy/girl colours because a) that always feels like a speed bump, as readers ask themselves if stereotypes are at play b) we wanted to make sure colours referred only to the main map. Note: this is a cropped version, the full interactive visual can be seen in related blog post and Tableau Public. I used Excel and data from DC Public Schools to highlight how the performance of black students on the PARCC lags behind that of other groups. I'm a huge fan of our local media company Charlotte Agenda and although my child is years from attending kindergarten, I like to stay informed about the many educational choices available. 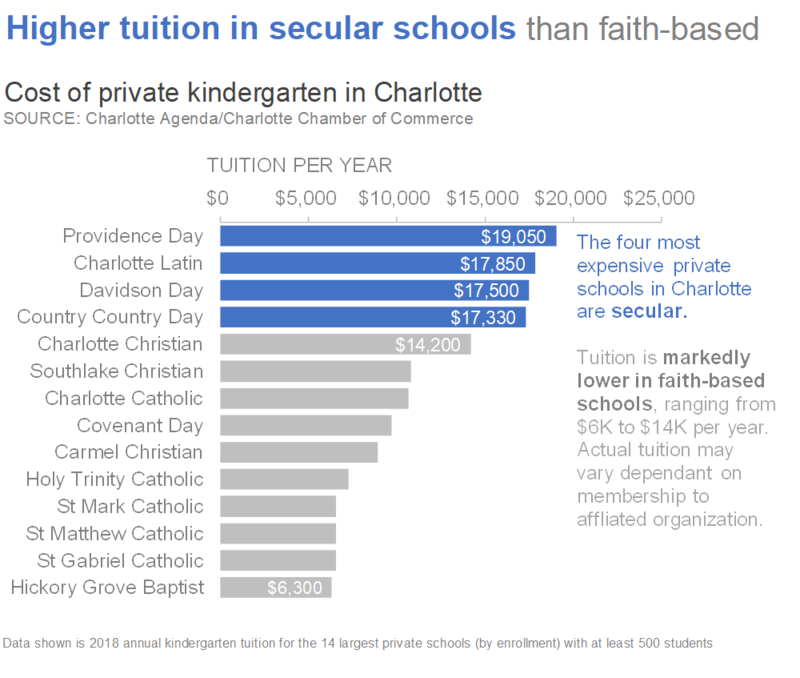 I appreciated this recent article on the cost of private tuition but I didn't see this takeaway until I visualized the data. The power of data visualization! Connect with Elizabeth on LinkedIn | Twitter. 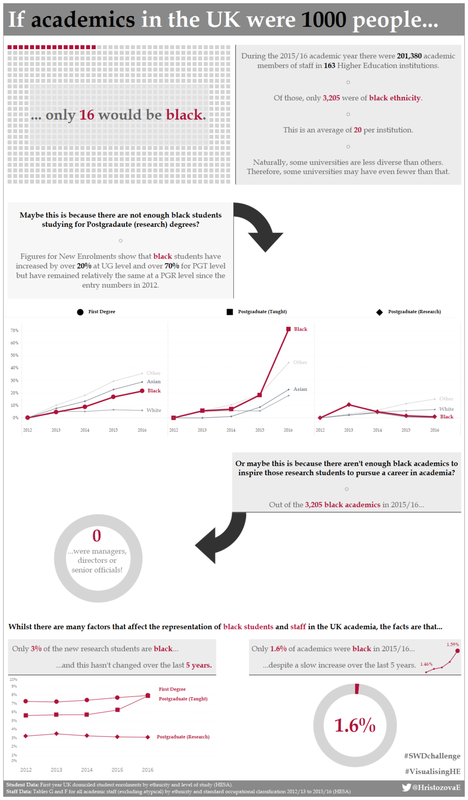 My submission was developed in Tableau with a focus on the representation of black people in UK academia. I initially wanted to use only data on academic staff but after I realised how underrepresented this ethnic group of people is, I expanded my scope and looked and the trend in newly recruited postgraduate research students, as I think that this is often the time when one starts to seriously consider the possibility of pursuing career in academia. I used several charts and combined them in an infographic-style dashboard with no built in interactivity - in this way I had to ensure that I maximised the use of text and colour to highlight the areas of importance. I took inspiration from last year's week 48 #MakeoverMonday submissions of 'The world as a 100 people'. I also decided that to deviate from your tips and go with a 'curious' rather than 'takeaway' style title. The data is obtained from the public data releases by the Higher Education Statistics Agency (HESA). The dashboard can be viewed (and downloaded) from my Tableau public profile but you can also follow me on Twitter. The visualisation was developed as part of the #VisualisingHE project. 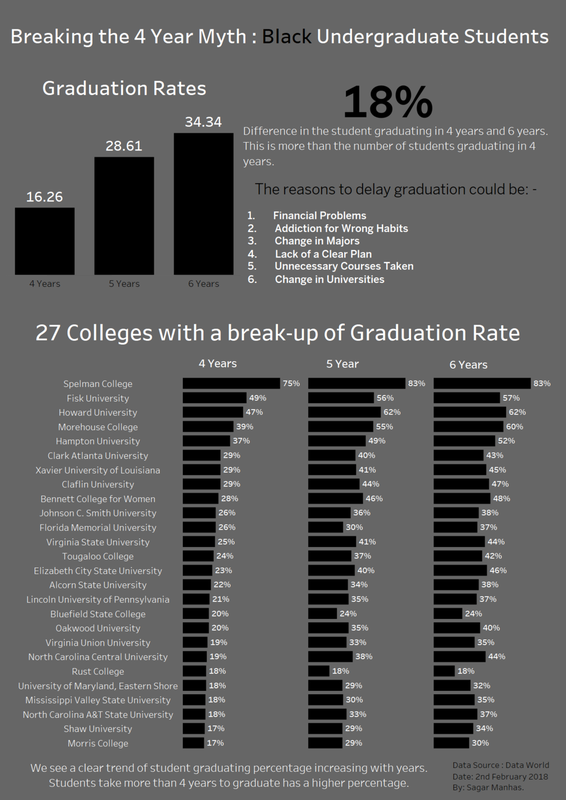 This is a newer version of a data visualization that I did in Josh Tapley's Data Viz class at Temple University. I butchered the color and the call to action in the earlier version. I hope I did a better job this time. Working off a red and black logo is tough! I debated not using color (only shades of gray) in the heat map, but in the end decided to add color to that, too. My entry this month looks at matriculation rates at the University of Washington amongst different ethnicity groups from 2006 to 2014. 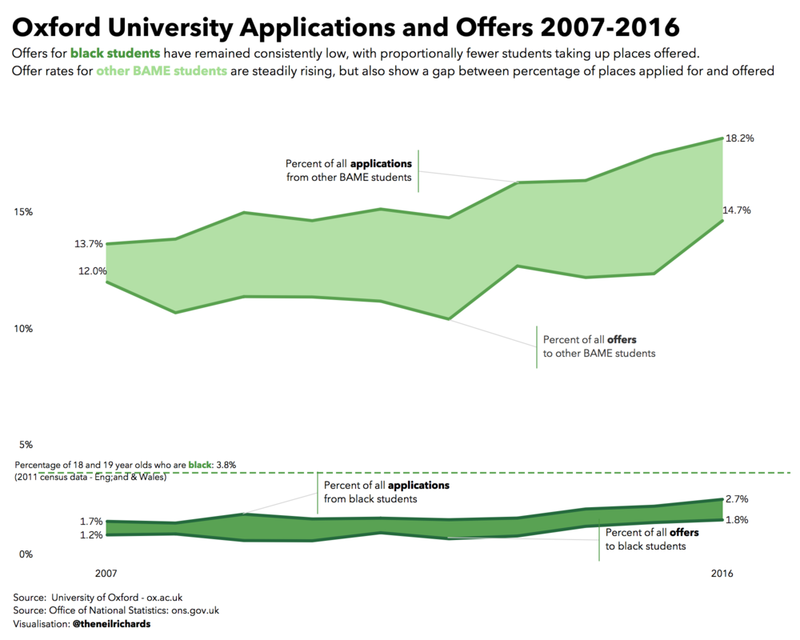 The slopegraph highlights the increase in matriculation rates amongst African American students despite decreases from all other ethnicity groups. The visualization was built in Tableau using data from the University of Washington's Office of Minority Affairs & Diversity. Interactive version. After finding a suitable dataset (High School graduation rates), I wanted to understand how attainment changes not just by ethnicity but also across the country. Yes the national trend is showing improved graduation rates yet within this high level approach there are a number of stories. A number of states consistently show attainment rates below that of the national trend, these include D.C, the South East as well as the Pacific Coast. I’ve used a modification of the Hex Map concept to show the variation against the national rate. I toyed with using a multiple map in grid format, however thought that this approach helped to bring out the effects at the regional level – quite useful for a Scotsman who isn’t particularly well versed in American Geography. Colours – I’ve used a warm maroon as being positive and a cool green as being negative. No particular reason for this other than to avoid using Green / Red (Colour blind) and Red / Blue (Political Parties). 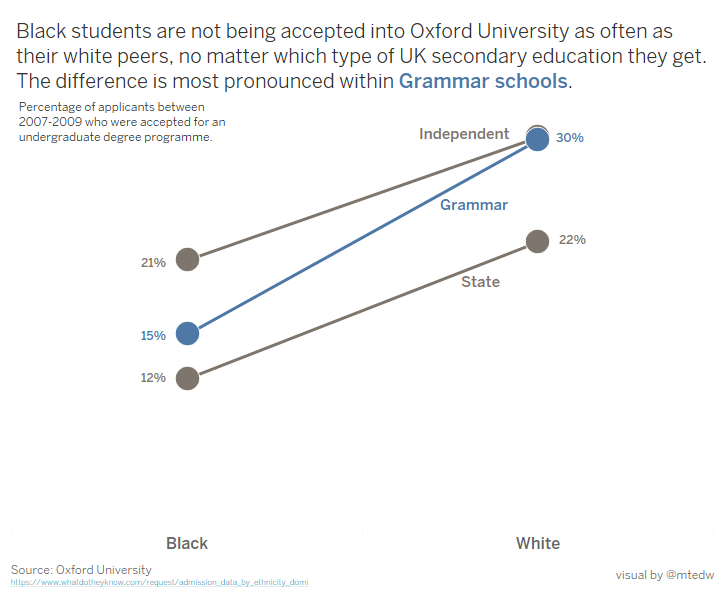 I’ve used colour in the Hex map at the bottom to highlight the differences between White and Black students. I found this interesting as the large differences between ethnicities don’t necessarily relate to poor performing states. For example in the state of Wisconsin the overall performance is much higher than the national average, however black students are far less likely to graduate with a rate of 64.1% compared with their white colleagues 92.9%. I'll wrap up by expressing my huge thanks once more to everyone who participated who took the time to create and share their work. Thanks also to those reading (if you've come this far, please click the ❤ below—it's a good stat to help reinforce that the work to post all of these is worthwhile) and stay tuned for more #SWDchallenges to come!